Information on potential data breach affecting reservations made a Starwood properties (including Sheraton) prior to September 10, 2018. Sign up for an Annual Meeting Minicourse! Friday noon invited plenary panel: on Fostering a Culture of Inclusion in Linguistics, featuring Savithry Namboodiripad (University of Michigan), Lynn Hou (University of California, Santa Barbara), and Corrine Occhino (Rochester Institute of Technology). Moderated by LSA President Penelope Eckert (Stanford University). In addition, three plenary poster sessions will be held on Thursday from 5:30 - 7:00 PM and on Friday and Saturday from 10:30 AM - Noon. To find out more about having a presence at the LSA Annual Meeting, consult the LSA's Prospectus, click the red "Become a Sponsor" button at the top of this page, or email David Robinson, Director of Membership and Meetings. The Call for Organized Session Proposals is available here. Abstracts for regular posters and papers may be submitted online from June 1 through July 31, 2018 (login to LSA website required). Please refer to the Call for Abstracts for more information about submitting an abstract and links to sample abstracts. The Five-Minute Linguist is a high-profile contest during which selected speakers will be judged on their ability to present their research in a brief but informative way. These five-minute presentations should be lively and engaging, delivered without notes on a stage without a podium, with audiovisual effects of the speaker’s choosing. The talks should be directed to a nonspecialist audience, may come from any subfield of the science, and must display qualities that will attract interdisciplinary interest. The Five-Minute Linguist 2019 is sponsored by the Montclair State University Departmenet of Linguistics. 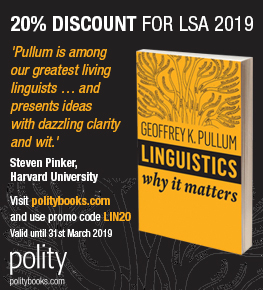 The LSA is delighted to announce that Pop-Up Mentoring (PUM), an initiative of the LSA's Committee on the Status of Women in Linguistics (COSWL), will be available at the 2019 Annual Meeting. PUM is open to all, regardless of gender or career stage. To read more and to sign up as a mentor or mentee, click here. Please sign up to be a mentee or a mentor no later than December 21. Preregistration for the 2019 Annual Meeting will be available from September 1 through December 14, 2018. To preregister for the meeting, please log in to the LSA website and click on the red "Register for Meeting" button at the top of this page. Be sure that you are logged in to the website so that you can obtain the member registration discount. Note that meeting registration fees are normally nonrefundable. Preregistrants may claim their conference badges and handbooks at the registration desk beginning at 1:00 p.m. on January 3. Any attendees who have not preregistered for the Meeting by the December 14 deadline will need to register onsite during the hours listed immediately above. Click here for information provied by NYC & Company, the New York City Convention and Visitors Bureau, on local transportation. Click here for more information about what's happening on Broadway, and here for money-saving attraction passes. The NYC & Company Delegate Discount Pass, valid January 1st through June 30th, is also available here. It can be used electronically or in print. Click here for a map provided by NYC & Company, the New York City Convention and Visitors Bureau, on dining and attractions near the Sheraton. Attendees at the New York City meeting who need ASL/English interpretation must notify the LSA Secretariat and register for the meeting by November 15, 2018. Presenters who plan to present in ASL must also notify the Secretariat by that date in order to ensure that interpretation is provided. All requests should be sent to David Robinson, Director of Membership and Meetings, with the words "2019 Meeting ASL Interpreting Request" in the subject line. Please include a list of LSA sessions and/or papers you expect to attend, including plenary addresses, the business meeting, and the Presidential Address.View the meeting schedule online here. All requests will be forwarded to the interpreter coordinator for the New York meeting, who will identify qualified local interpreters, assist with scheduling, and handle day-to-day logistics concerning interpreting. Attendees who will be bringing children to the Annual Meeting should notify David Robinson no later than December 1 of their intentions. The LSA will make available information about local child care providers and facilitate mutual child care. Annual meeting presenters may be reimbursed up to $100 for child care expenses incurred in conjunction with the Meeting. A Lactation Room will be provided if requested. 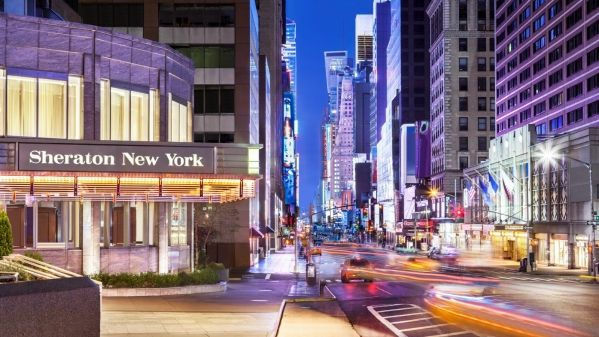 The Sheraton New York Times Square has reserved a block of rooms for those attending the 2019 Annual Meeting. The Sheraton is one of New York City's largest hotels, and is convenient to public transportation, major landmarks, and the innumerable dining and entertainment options offered by The Big Apple. Read more about why attendees should book with the LSA Room Block for the 2019 Annual Meeting. Book your room online here or book by phone at 1 (800) 325-3535, being sure to request the Linguistic Society of America rate. Attendees looking to find a roommate for 2019 Annual Meeting may use this Facebook group to coordinate with other attendees.